Brazzaville, 27 July 2018 - The Director-General of the World Health Organization (WHO) has commended the Republic of Congo’s commitment to strengthening its health system through the primary health care approach, during a three-day visit to the Central African country, which ends on 27 July. 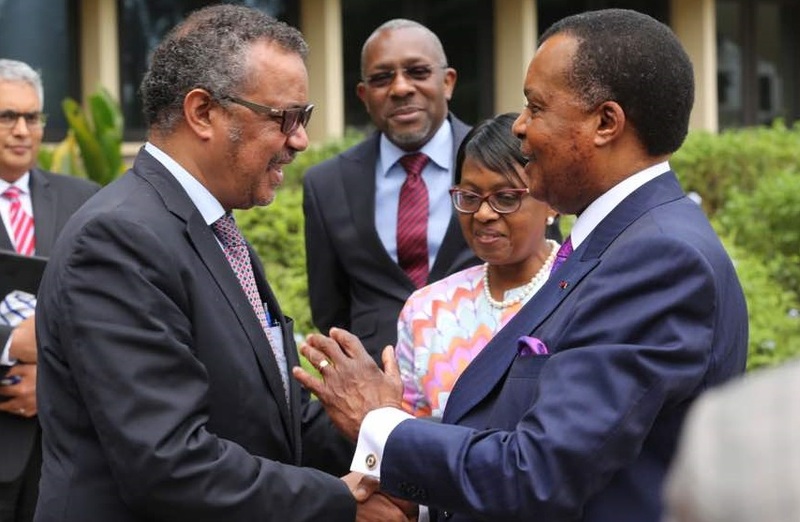 During his first official visit to the country since his election as Director-General of WHO last year, Dr Tedros met with President Denis Sassou Nguesso, who has stated that health is a priority in the country’s development plans. Despite an economic downturn the government has significantly increased its investment in the health sector from 5% in 2017 to 13% in 2018. The Minister of Health and Population, Jacqueline Lydia Mikolo gave Dr Tedros and Dr Matshidiso Moeti, WHO’s Regional Director for Africa a tour of Moukondo Integrated Health Centre in Brazzaville. The facility provides a range of services, including vaccinations, diagnostics, curative and antenatal care to more than 34 000 residents. Dr Tedros also met with First Lady Madame Antoinette Sassou Nguesso, who is a strong advocacte of the National Sickle Cell Centre, which is situated at the Brazzaville Teaching Hospital. He congratulated the First Lady on her commitment. While WHO has a country office in Congo, Brazzaville is also the headquarters of the organization’s Regional Office for Africa, which has supported Congo through more than 30 missions in priority areas identified by health authorities. Regional experts have helped develop a national health plan, mobilized international resources, implemented priority programmes such as maternal, child and adolescent health, as well as immunization programmes. Dr Tedros visited the Regional Office, where he had a town hall meeting with staff. Prior to his mission to the Republic of Congo, Dr Tedros and Dr Moeti participated in an event in Kinshasa, marking the end of the Ebola outbreak, only two and a half months after it was first publicly declared by DRC health authorities. Three-quarters of the 360 people deployed for the Ebola response were from the region.